Car apps can help you find your next car, rent a car, find cheap gas prices or the most efficient route, make it safer to use your phone in the car, and even find your car for you when you forget where you parked. Since phones have limited space, and you probably don't want to waste your mobile data downloading apps when you're on the road, it's important to install the best ones well ahead of time. With that in mind, we've pulled together a list of the 10 best car apps over a wide variety of categories. These apps are all available for free, although some of them do have premium versions. That means you can download and check them all out without paying first. Most of the apps on our list are available for Android and iOS, and links are provided to Google Play and the App Store. In cases where an app isn't available for both platforms, we have provided a decent substitute option. 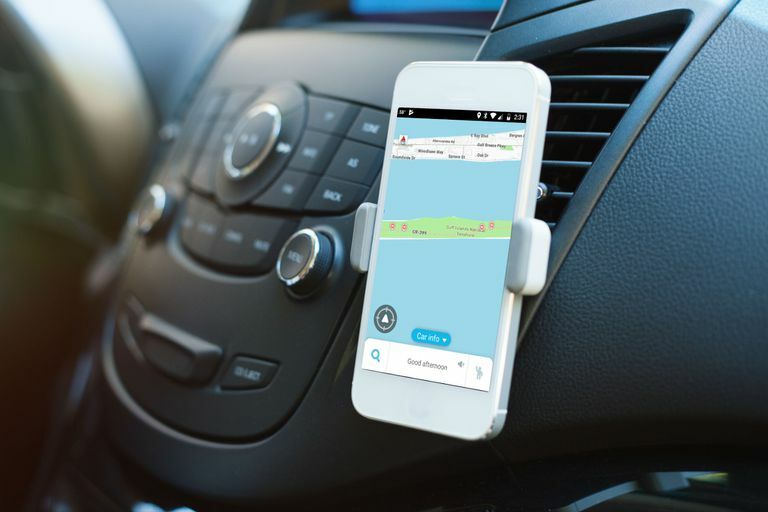 Waze is one of those essential apps that every driver should have, because it's the kind of app that gets more and more useful based on how many people in your area are using it. In addition to live traffic, Waze also allows fellow users of the app to provide useful warnings about road closures, speed traps, construction delays, and more. That makes it great for shaving some time off your commute, but it has also been a massive help to evacuees during natural disasters. Alerts you to things like potholes and speed traps that other apps don't know about. You can start using it without creating an account. Includes an optional carpool feature if you don't mind riding with strangers. If you live in an area where nobody uses the app, you won't get as much out of it. No lane guidance included with the navigation feature. GasBuddy is another app that relies on crowdsourced data, but it's designed to help you find the cheapest gas wherever you are. Users are able to report gas prices through the GasBuddy website or app, and you can use the app to access that data when you're on the road. The app is free, but there are two premium yearly memberships that add perks like discounted gas and roadside service. You can also sign up to use their basic Pay with GasBuddy service for free, which nets you a smaller discount on gas at participating locations. Save money, and time, by going straight to the cheapest gas around. Earn entries for daily prize drawings by submitting fuel price reports. Price accuracy and availability relies on user reports, so you may run into inaccuracies if few people in your area use the service. There are a ton of apps that can help you find a parking spot, and some of them even let you pay right through the app. The problem is that if there is any breakdown between the app and the parking lot or garage, you're typically the one who is liable for any fines. Parkopedia doesn't include an in-app payment feature, but it does have a massive index of over 60 million parking spaces in over 8,000 cities around the world. That's better coverage than most of the competitors, which is more than enough to make it worth a download. Features parking spaces in many cities that just aren't covered by other apps. Includes vital information about availability, hours and pricing. ParKing is another app that's focused around parking, but it's designed to help you find your way back to your car when it's time to go. It's extremely easy to use, and you can even set it up to log your parking location automatically if you have a Bluetooth device in your car. The reason ParKing is better than the competition is that it includes wearable integration, so you can log your parking spot and find your way back without getting your phone out if you have a smartwatch. Allows you to record your parking spot manually on your phone or smartwatch. Includes an option to record your parking spot automatically. Has a built-in feature to snap a picture of your space if you park in a large parking garage facility. The banner ads can be intrusive. Torque is one of the original apps designed to interface with ELM 327 OBD2 code readers via Bluetooth and Wi-Fi. There are a lot of competing apps that do the same basic thing, but Torque still gets the job done. If you're willing to buy a Bluetooth or Wi-Fi ELM 327 code reader, you can connect it to this app to read trouble codes if your check engine light is on, and pull all sorts of other useful information out of your car's onboard computer. You can even use it when you're driving to display your speed and a ton of other interesting data sets. One of the cheapest ways to find out why your check engine light is on. If you want to attempt repairs yourself, the app can clear the trouble codes when you're done. Functionality without an ELM327 device is extremely limited. Ads in the free version can be intrusive. Most OBD2 scanner apps for iOS require specialty hardware and don't work with generic ELM327 devices. If you have an iOS device and an ELM327 device, try out Car Scanner ELM OBD2 on the app store. Cars.com is one of the best sites to buy a car online, and the associated app has even more features. The basic functionality of the app is that it lets you search for new and used cars at dealerships in your area, including details and features of individual vehicles. It also includes dealer profiles and reviews, and even a market comparison tool to show what similar vehicles have sold for in your area. The killer feature of the Cars.com app is the On the Lot tool. Pull this tool up when you're at a dealership, and it will instantly provide you with the inventory of other local dealers, including special offers, that may help you negotiate a better price. Easier to use and better information than competing apps. Price quote option allows you to contact dealers right through the app. Includes additional useful tools like a payment calculator. Only useful for new cars and used car dealerships. If you're more interested in a used car than a new car, then Used Car Search Pro is one of the best tools you'll find. This app searches a database of more than 40,000 dealerships, and private listings, to locate the exact car you want. The killer feature of Used Car Search Pro is that the app calculates the market value of every used car in its system, so you can see at a glance if the seller is asking too much. Market price feature allows you to see if you're likely to overpay. Listings are automatically sorted to show the best deals based on market data. Includes objective ratings for each dealership in the system. All of the major car rental companies have their own apps, and they all work just fine. If you want to install just one app instead of dozens, the Rentalcars.com app is the way to go. This app allows you to see availability and pricing for cars in your area from all of the big name car rental companies. If you primarily rent from a single rental car agency, then download their app, and if you want to book airfare or a hotel at the same time as your car, download the Expedia or Kayak app. Otherwise, the Rentalcars.com app has the best coverage, in the most locations, wherever you end up traveling. Provides information about all the major car rental agencies without having to download multiple apps. Lets you book a car rental right from the app if you don't want to call the agency yourself. Works with hundreds of local rental agencies in more than 53,000 locations around the world. Some users report customer service issues in cases where there is a problem with the booking. Turo is basically Airbnb for cars. Instead of renting someone's house or condo, you rent their minivan or Ferrari. It's basically an alternative to the big rental agencies that can save you money, especially during peak tourism season when specific vehicles can be tough to find. It also provide access to specialty and high end cars that the regular rental agencies just don't have. Provides an alternative to the big rental agencies. You can rent cars that you can't rent from regular car rental companies. Since you're renting from private parties, your experience may vary. Drivvo is the app you need if you want to track expenses associated with your car and keep on top of maintenance. The basic functionality requires you to put in your mileage whenever you fuel up, and it builds a record over time of how much your car costs to operate. This makes it a lot easier to budget for car-related expenses in the future. Automatically calculates fuel economy, so you can adjust your driving habits accordingly. Includes vehicle maintenance records management with reminders. Can also help find cheap fuel prices if other people in your area are using the app. Less coverage than GasBuddy for fuel prices.